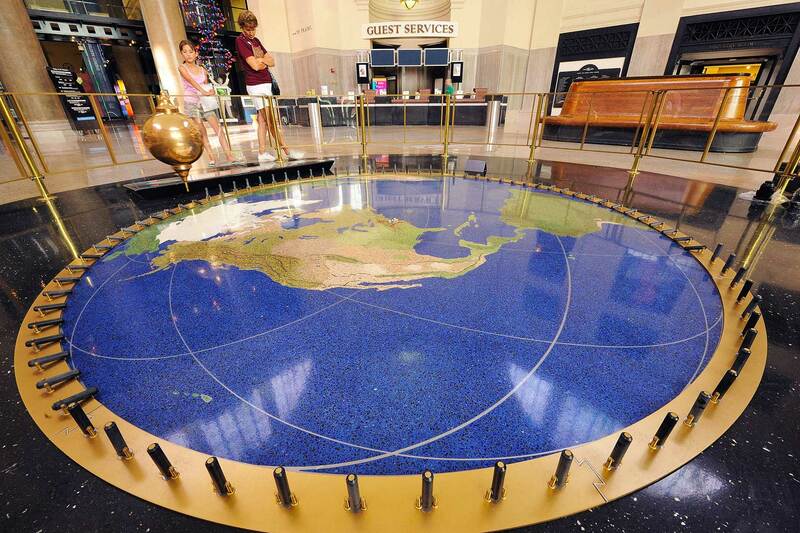 The Science Museum of Virginia, located in Richmond, wanted to upgrade the exhibit in their lobby replacing the existing Earth Map under the Foucault pendulum with an epoxy terrazzo image of Earth as seen from space. 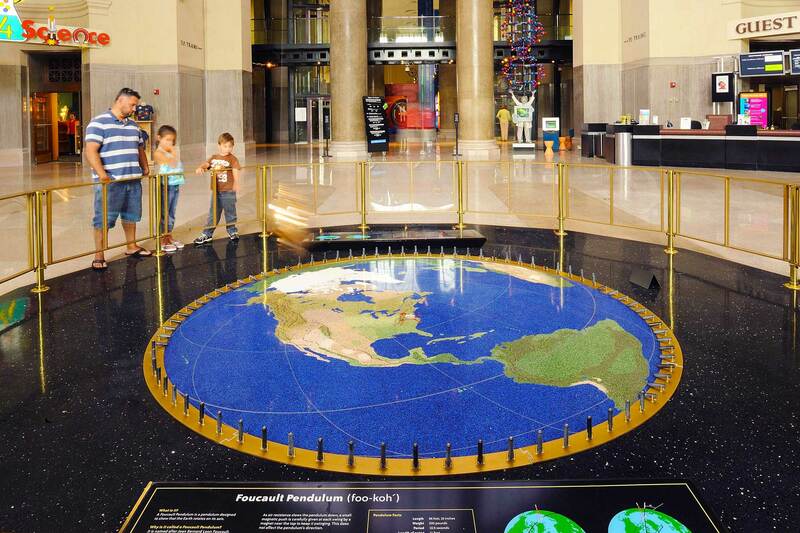 The museum provided a full size map for the project. 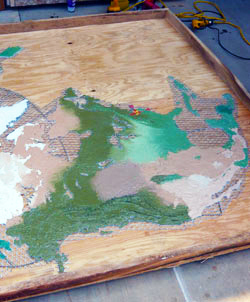 I created sample colors to imitate the map colors and textures and then fabricated the strip designs used to divide color areas in the earth, primarily divisions between land masses and the oceans. 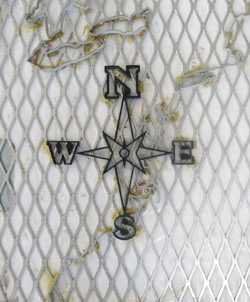 1.The center of the map was oriented over Richmond and a compass rose of black plastic was designed to highlight that area. 3.The combination of chip mixes with the matrix colors creates a speckled floor that is easy to maintain, durable and great art, as you will see. 5.South America was the next portion I poured. The museum desired to mark some of the major mountain ranges. 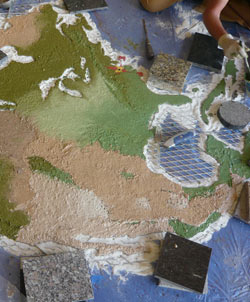 I used a thickening agent to mold the terrazzo into mountain ridges and a few large lakes. 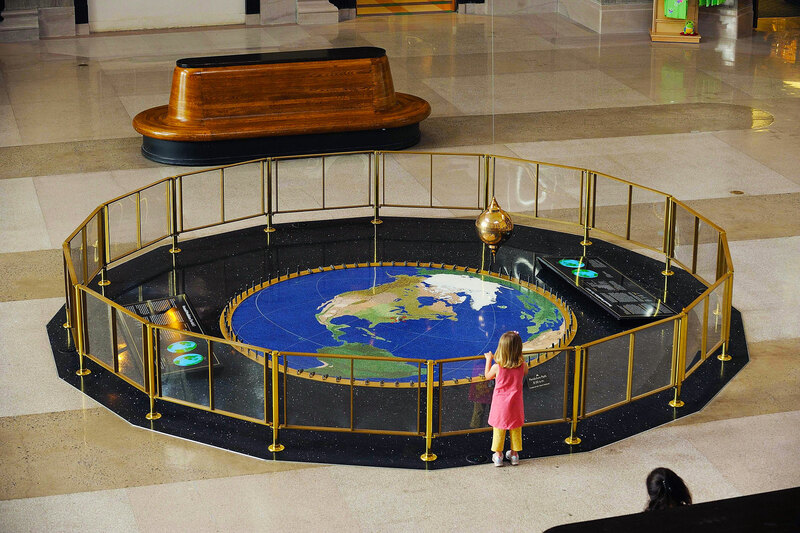 When the terrazzo is ground, these raised areas become contrasting brown lines or blue shapes within the other land colors. 7.When I had finished pouring the land and adding a few islands, I reviewed the assembly with the installation mechanic, packed up my baby and sent it off to Richmond. 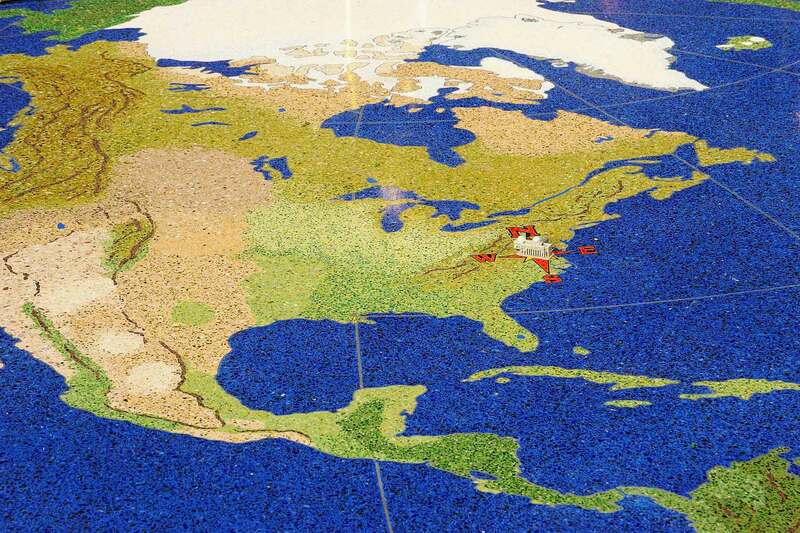 2.The epoxy terrazzo is formed from three basic parts: an epoxy matrix which looks much like house paint and can be obtained in the same colors, a clear liquid hardener, and aggregate which is usually marble or glass chips. 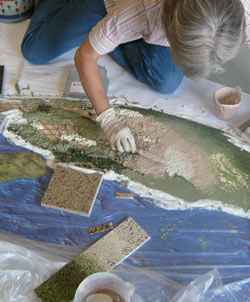 4.In this photo, you can see me pouring the portion of Africa that is exposed. 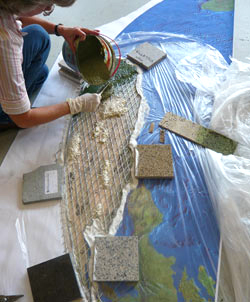 Due to schedule and site constraints, we poured all the land masses at our company site. 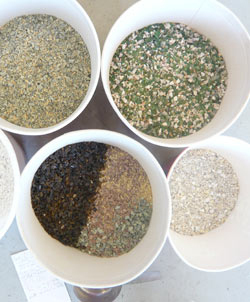 Usually terrazzo is poured directly on location in huge batches with less color variation. This project was unique because it gave us an opportunity to show how the medium can be blended for special effects. 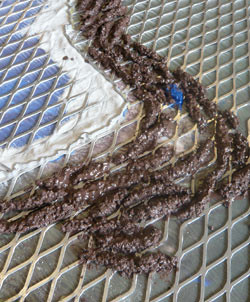 6.When the grinding crew was finished, the speckled blends of colors were exposed. 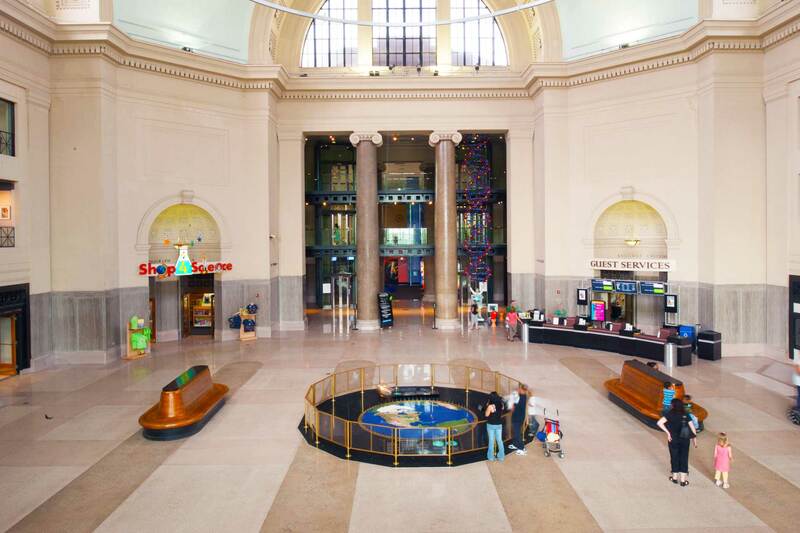 The construction barrier has since been removed and the exhibit is open once again. I hope to make a trip up and see it for myself. Maybe you will too! 8.When the grinding crew was finished, the speckled blends of colors were exposed. 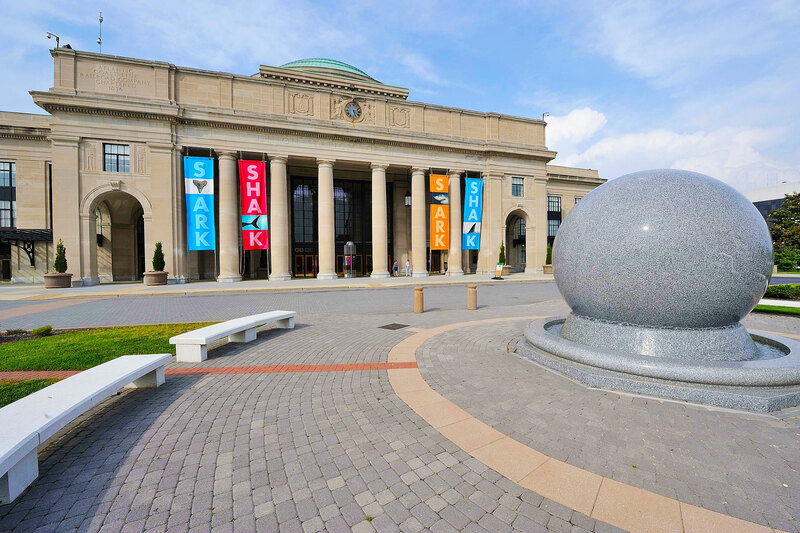 The construction barrier has since been removed and the exhibit is open once again. I hope to make a trip up and see it for myself. Maybe you will too! 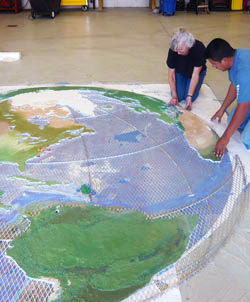 Fin.The five portions of the earth map were adhered to the floor with epoxy. Then the water areas were poured as well as a black border with mirror chips that sparkle like stars when you walk around the exhibit.